Chronic regeneration of damaged endothelial cells at sites of disturbed blood flow in the vasculature promotes the development of atherosclerosis. Now an LMU team has further elucidated the role of a short RNA molecule in atherogenesis. Atherosclerosis – the condition popularly known as hardening of the arteries – develops almost exclusively at junctions and sharp turns in the arterial tree. This is because, at such sites, the endothelial cells that form the lining of the blood vessels are particularly sensitive to damage – and must be constantly repaired or replaced. A research team led by LMU’s Andreas Schober has now provided further evidence that a specific micro-RNA, called miR-103, can stimulate the development of atherosclerosis. Their findings appear in the journal Nature Communications. As the blood courses through unbranched arteries, the endothelial cell layer is exposed to high shear stresses. Not only does the endothelium withstand these stresses, they are actually required to maintain the function of the cell layer. However, bifurcations or tight turns in the vasculature disturb the flow by causing turbulence, which reduces the shear force imposed on the endothelium. This in turn has deleterious consequences for the endothelial cells at such sites. “As a result, endothelial cells located at bifurcations are subjected to chronic damage and must be constantly replaced,” Schober explains. This process is accompanied by the accumulation of lipids on the inner face of the blood-vessel wall, which leads to inflammatory reactions that stimulate the formation of atherosclerotic lesions. As we get older, these lesions tend to grow, which can have life threatening repercussions. 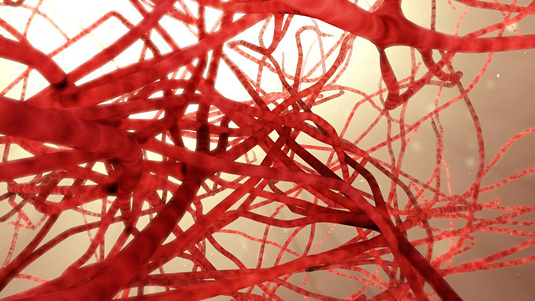 Short RNA molecules known as microRNAs have emerged as crucial regulators of the regeneration of the endothelial cell layer at sites of arterial bifurcation. Many of these RNAs interact directly with messenger RNAs (mRNAs) and inhibit the synthesis of the proteins they encode. Indeed, Schober’s group had previously discovered that miR-103 promotes inflammation by suppressing endothelial cell adaptation to mechanical stress in this way. Other miRNAs bind to long non-coding RNAs that are involved in the control of gene regulation at the epigenetic level, and can therefore regulate biological processes more rapidly and directly. The potential impact of this latter class of RNAs – members of which can also interact directly with proteins – on the development of atherosclerosis has so far remained unclear. “We have now shown that binding of miR-R103 to one of these long non-coding RNAs promotes the progression of atherosclerosis,” Schober says. The long non-coding RNA, named lncWDR59, normally supports the proliferation of endothelial cells and reduces their susceptibility to DNA damage caused by oxidized lipids. Binding of miR-103 to lncWDR59 effectively blocks both of these functions. Schober and his colleagues went on to show that specific inhibition of the miR-103/lncWDR59 interaction in a mouse experimental model indeed delayed the development of atherosclerosis. “We have found similar mechanisms in the human vasculature, so that the inhibitor molecule we used in the mouse may be of therapeutic value,” Schober adds.